Formerly published as LADY KNIGHT. When Michael Turco's brother is injured in a tournament at a Medieval Fair, the Florida Highway Patrol lieutenant suspects it wasn't an accident and begins his own personal investigation. Which causes him considerable anguish when he has to enlist the aid of Kate Knight, who is his entree into the Lords and Ladies of Chivalry (LALOC), a Medieval re-enactment group. Kate, who has been fighting her way out of abuse for years, is equally appalled. Michael will pose as her boyfriend, and she, who has been celibate for years, will be forced to share a postage-stamp-size tent with him nearly every weekend until the mystery of a series of disasters at Medieval Fairs and LALOC events is solved. Michael has his own problems, finding the adjustment to LALOC's Medieval lifestyle, including costumes he can't believe he's wearing - and bowing to a chair? - a severe trial. He must also cope with a multitude of quirky personalities among Medieval enthusiasts who take themselves very seriously indeed. Plus a rash of new, ever more serious, "accidents." And then there's Kate, who seems to be mellowing until she gets a look at him in full FHP uniform. Author's Note: FLORIDA KNIGHT is a look at the double lives led by those who embrace the Medieval re-enactment lifestyle. The story is fictional, the background is not. I volunteered for many years at the Medieval Fair at the John & Mable Ringling Museum in Sarasota, and I was a long-time member of the Society for Creative Anachronism (SCA). I wrote LADY KNIGHT at that time. 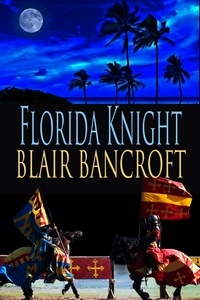 But so many other books now have that title, I changed this re-edited version to FLORIDA KNIGHT. For those who are interested in learning more about weekend immersion in Medieval culture, check out: www.sca.org. "Bancroft couldn't have chosen a more original background. . . . I had a great time reading this novel. Bancroft's characters are funny and heartwarming. I found myself rooting for all of them. The connections between them are genuine, their troubles tugging on my heartstrings and their successes making me smile." I highly recommend this book. If you love historicals or contemps this tale is for you as it has both elements and is a great mystery. On my lip stick scale this rates 5."